To be able to compare photographs, they have to be free from moods. They have to be as neutral as possible. You have to eliminate, and then you can compare anything that's taken from a similar angle. 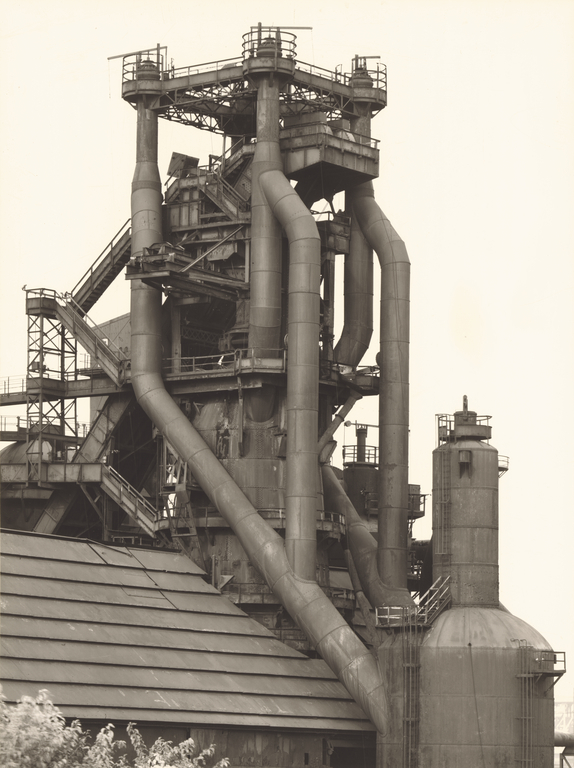 Developing a systemized approach that they employed consistently throughout their their joint career, Bernd and Hilla Becher documented the Western World's bulwarks of heavy industry, such as this blast furnace. Their no-frills approach is evident in the way that they carefully centered this building's complex structure to fill the picture frame. They also took advantage of natural, even light to reveal reflective surfaces and multiple tiers of scaffolding in exquisite detail. Hilla Becher has likened the blast furnace building type to an "octopus," with its extended pipes resembling tentacles. When she and Bernd initially considered photographing blast furnaces, it seemed a daunting task. Ultimately, it became her favorite type of structure to approach for the challenge it presented of making sense of its complex form through multiple views. Built solely for the function of smelting iron ore, the blast furnace is one of a number of archaic, anonymously constructed industrial building types that the Bechers focused on throughout their career. Other building types include: lime kilns, cooling towers, winding towers, water towers, gas tanks, and silos. In the forward to their book Anonyme Skulpturen (Anonymous Sculptures), the Bechers wrote of their subjects: "They are generally buildings where anonymity is accepted to be the style. Their peculiarities originate not in spite of, but because of, the lack of design." Created by the artists, Bernd and Hilla Becher, German, partnership 1959 - 2007 (Germany), by gift to Earl (Scott) Davis, 1980 - 1981. Solomon Fine Art (Dana Point, California), sold to the J. Paul Getty Museum, 2006. Becher, Bernd and Hilla Becher. Blast Furnaces (Cambridge: MIT Press, 1990), pl. 3.